Five sketches with thirteen characters all written and voiced by the same person. Things get a little weird at times, but in a good way, a funny way, because this is a comedy album. Please listen. Please laugh... in a good way. 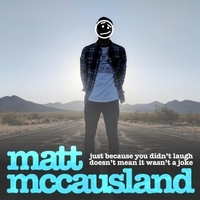 Just Because You Didn’t Laugh Doesn’t Mean It Wasn’t A Joke is the first sketch comedy album by Matt McCausland, a comedy writer based in Toronto, Canada. Matt wrote five sketches and did the voice acting for all thirteen characters. Things get a little weird at times, but in a good way, a funny way, because this is a comedy album. Two of the sketches are fake commercials for products that would actually be pretty awesome (but probably also illegal). One sketch is about laughing, one is a story about texting, and two are about poop. Wait, that’s six sketches! Two were about the same sketch, so still only five. Calm your body. Matt McCausland wrote all of the sketches and did the voice acting for all thirteen characters. The sound effects and background ambient noises are licensed under a creative commons license. Special thanks to Belinda Alzner, Jonathan Keebler, Grant Sanger, and Isabel Ross for reading and listening to terrible early versions of every joke and sketch I’ve ever written.